Orion is a constellation in the region of the celestial equator, of which almost everyone knows. The second brightest and largest star of Orion, Betelgeuse, inspired many scientists and artists. Recently, ALMA (“Atakamskaya large grating millimeter range”, a complex of radio telescopes in Chile) received a new photograph of the famous star, which today is one of the clearest images of the surface of the star. 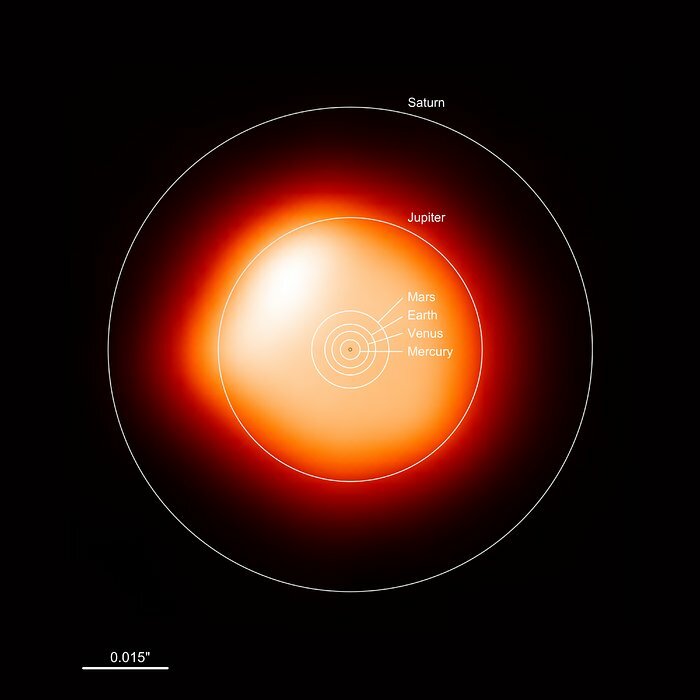 Betelgeuse is a red supergiant whose mass is about 13-17 solar masses, with a radius 1200 times greater than the solar mass. In simple terms, it exceeds even the distance from the Sun to Jupiter. Astronomers have noticed that the star loses its mass, and became interested in why it happens and how exactly the loss of mass will affect the final death of the star. A snapshot of it was made on November 9, 2015, but the processing of all the data took about one and a half years. 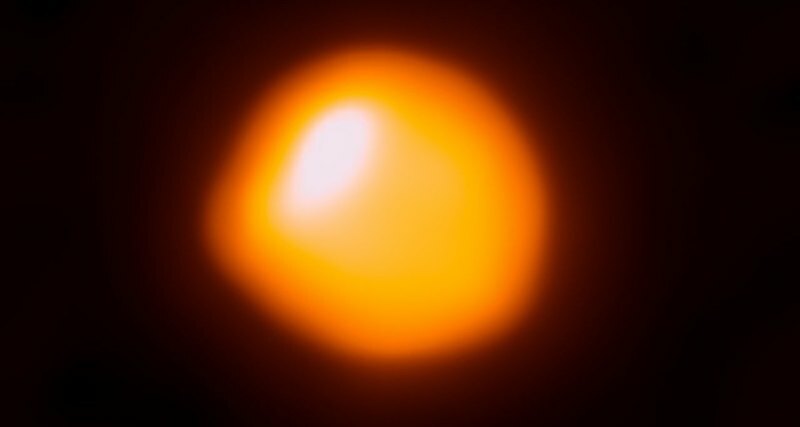 Writer and astronomer Ian MacDonald of Manchester University points out the strange shape of the star: usually stars are spheres, but Betelgeuse can see a kind of “outgrowth” on the left side, as well as points of temperature difference on the surface – some are hotter than others. Localized areas of heating are also in the Sun, but the author of the study, Imon O’Gorman from the Dublin Institute of Advanced Studies, is surprised that such a phenomenon is observed on two so different stars. This collage shows the Orion constellation in the sky (Betelgeuse is identified by the marker), a zoom towards Betelgeuse, and the sharpest ever image of this supergiant star, which was obtained with NACO on ESO’s Very Large Telescope. One of the possible reasons for this is convection, akin to the movement of water in a boiling kettle. Knowing about these processes and about the diminishing mass, scientists can predict the future of the star. For example, what elements of the periodic table will arise after the Betelgeuse explosion directly depends on the degree and rate of loss of its mass. “If it explodes quickly, iron, nickel and gold with silver are formed. If this happens later, lead, barium, carbon or oxygen may appear, “explains McDonald.